Continue to meet service goals throughout the day, even when unexpected situations arise. In this program, you will learn how to apply intraday management tactics to cope with unforeseen events such as agents calling in sick, sudden technical problems, or unexpectedly high call volumes. Then you'll be introduced to proven practices to become an expert in managing attendance and schedule adherence. The program WFM - Intraday Management is also included in the bundles Staffing Essentials and Call Center Staffing. Self-paced e-learning containing an engaging mix of video, narratives, scenarios, and self-assessments. A certificate is provided if the mastery exam is passed successfully. It is critical to track how accurate your forecast is and how well your schedules are performing every half-hour of every single day to ensure service goals are being met and employees are being utilized effectively. This interactive e-learning course will provide you with the essential tools for managing staffing levels to maximize service while minimizing cost and staffing disruptions. 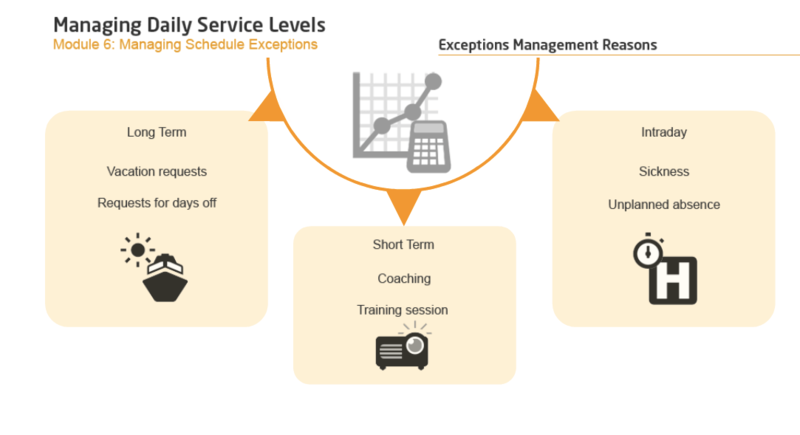 It will outline the process of tracking service within the day, define a wide range of overstaffing and understaffing reaction strategies, and provide you with practical solutions for managing the schedule exception process. Identify the components and manage the process used to track daily performance. Develop a communications plan should intra-day staffing changes be required. Implement reaction strategies from both a staffing and technology perspective. Understand the many types of intra-day activities that affect staff availability and how to track them. Outline the most critical measures of intra-day performance and when to use each one. In this module, we'll test your knowledge of the key learning points from the course. To score a passing percentage of 80%, you must answer 16 of a possible 20 questions correctly. This interactive e-learning course is designed to help contact centers manage both attendance and schedule adherence. It teaches how to define and quantify schedule adherence, communicate “The Power of One” to all contact center staff, and how to shape desired attendance and adherence behaviors through proper education and reinforcement. One of the toughest jobs related to workforce management may not be the intricate calculations of forecasting nor the numerous iterations of coming up with the most optimized schedule. The hardest part may come after the schedules are in place - simply ensuring there are frontline staff available when and where you need them to be. Some call centers are much more successful than others at this attendance and adherence dilemma. So how do you get staff to show up for work on Mondays and stick to their planned break times? This course will share proven practices on attendance and adherence that have resulted in increased availability. Quantify the cost and service implications of missing staff. Identify ways to communicate and educate staff on “The Power of One” in call center staffing. Describe options for setting adherence performance goals and selling them to the staff. 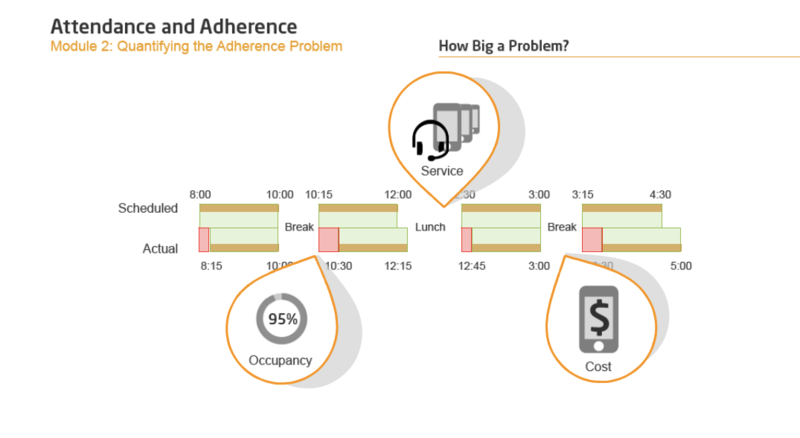 Identify reward and consequence programs that support adherence goals. After finishing the courses of the program, participants are eligible to take the mastery certification exam. A designation of Mastery Certification from The Call Center School validates and recognizes the learning achievements gained through the program. Participants who successfully pass the mastery certification can download their certificate and share it directly via social media. We offer bulk discounts for orders containing 5 or more seats for a program or bundle. Check our pricing options for WFM - Intraday Management below. If you apply for bulk pricing, please contact us to place your order. Ordering for 100 or more learners? We offer custom discounts for larger orders. Please get in touch with us for a quote. Gain understanding of the workforce management process by learning the 5 steps of WFM in this essential introduction. Learn how to gather and analyze historic call data, and apply advanced forecasting techniques to accurately predict call volume. Be able to produce expertly optimized schedules by defining service goals and calculating staff requirements accurately. The WFM - Intraday Management program is designed by call center experts to provide a practical and engaging learning experience. Start today.